Hello my lovely and devoted readers! Recently Tiffany from Royal Lacquer sent me an assortment of prototypes to review, now these will be available only in limited quantities and they aren’t part of any collection so if you see something you like you’ll need to snag them up because there is a distinct possibility that they won’t come around again! If you like purple, teal, or blue then perk up buttercup because there’s some loveliness coming your way! Let’s start with the purples! First up I have Violet Twist! First, I apologize in advance about the wonky skin tone in these pictures. I wanted you to see the polish as close as I could get it to the actual color and this is one of those blurple shades that cameras just don’t handle well! 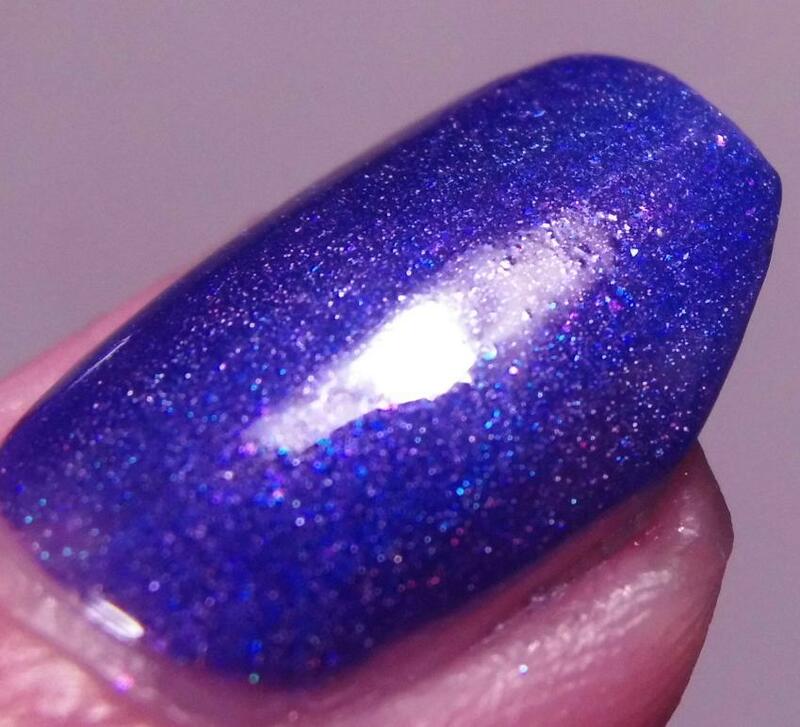 Violet Twist is a blurple-leaning grape purple jelly scattered holo with pink and blue shimmer. It’s gorgeous and would be perfect for nail art, leadlighting and other stamping technicques, and it just looks good on its own! Again, very sorry about my weirdly pink skin. But this is the closest approximation to the color I can get it! 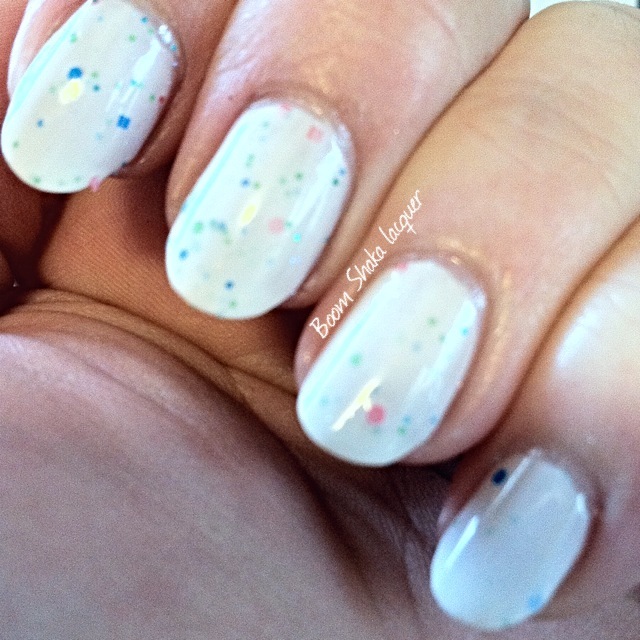 This is a jelly formula so it did take two good coats for opacity and I routinely top with topcoat as well. There were no issues with the formula and I found it very easy to work with and to build to opacity! Oh look this is new…I’m still working on perfecting these macros to try to give ya’ll a closer look at what is going on inside a polish. You can see some of the blue shimmer playing off here. When I’m able to capture a good macro I’ll start including it here! Looooook at that ya’ll! It’s so pretty! I’m going to reach for this one again and again I already know. 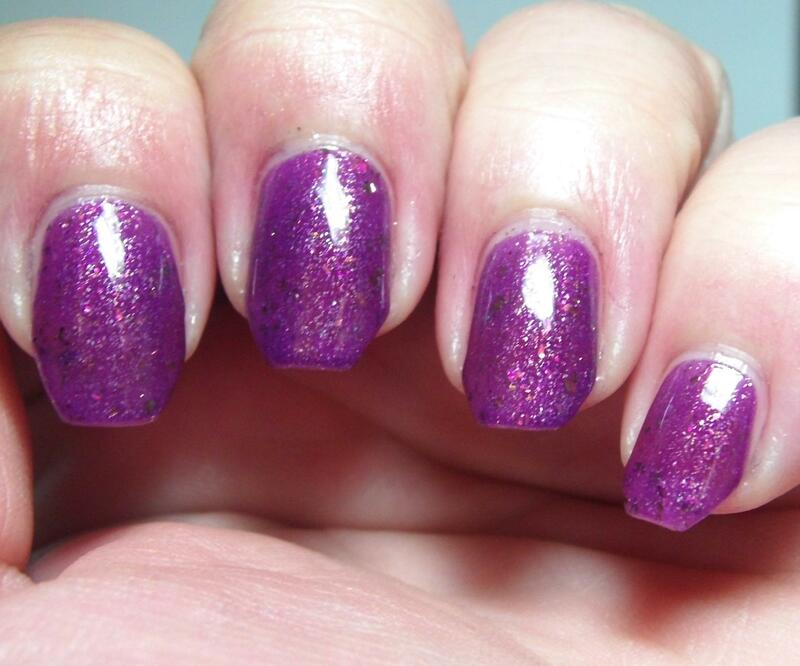 Jeweled Orchid is a lovely deep orchid colored crelly base with golden shimmer and a smattering of ultrachrome flakies. The flakies shift from purple to magenta to a sort of brass or orange gold color. It’s just a stunner! I love how it just seems to GLOW from deep in the depths of the polish. This was another easy breezy application. This picture shows two coats plus topcoat! I love how you can really see the flakies here! 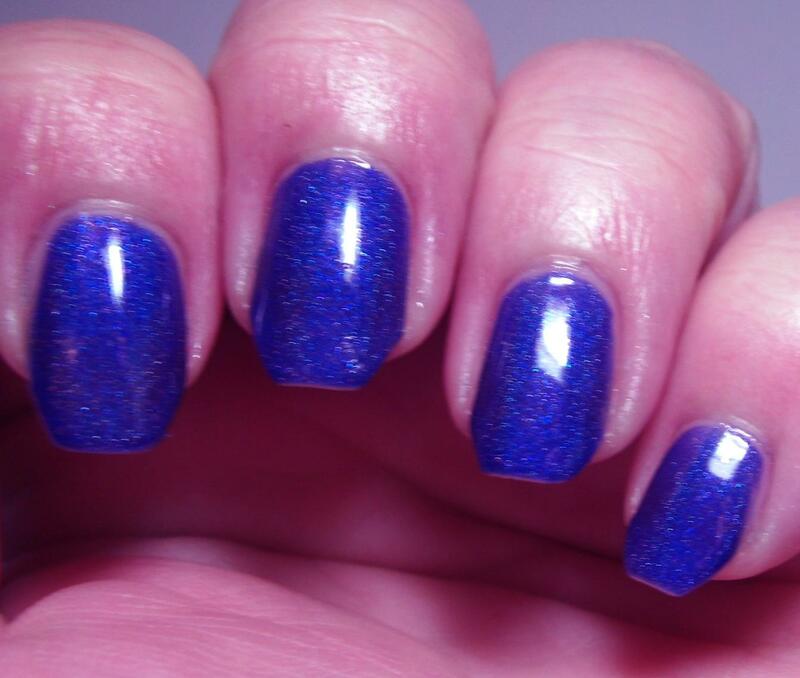 This is just a gorgeous polish you should definitely grab this one! Looooove jelly based glitter polishes. I just LOVE THEM. 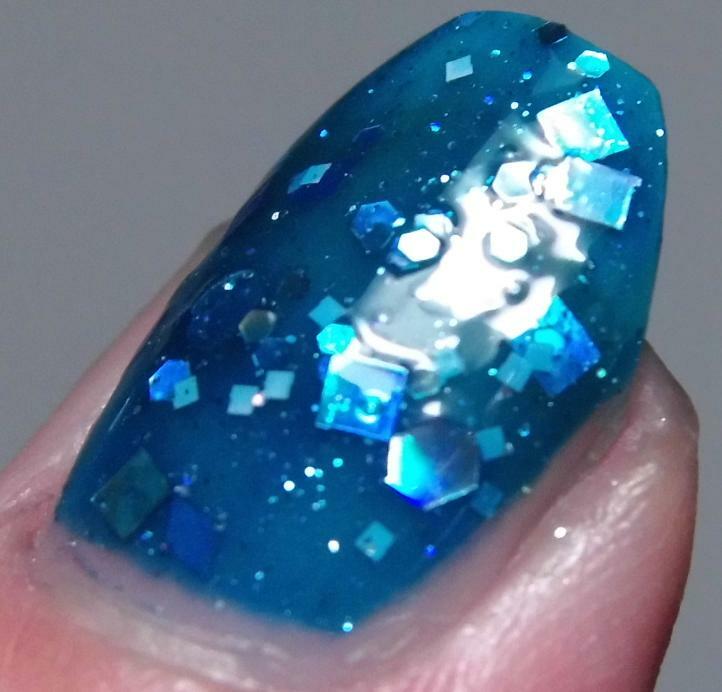 This one is a perfect squishy translucent teal-leaning lagoon blue with silver holographic glitters floating throughout. The glitters are hexes and squares in varying sizes. 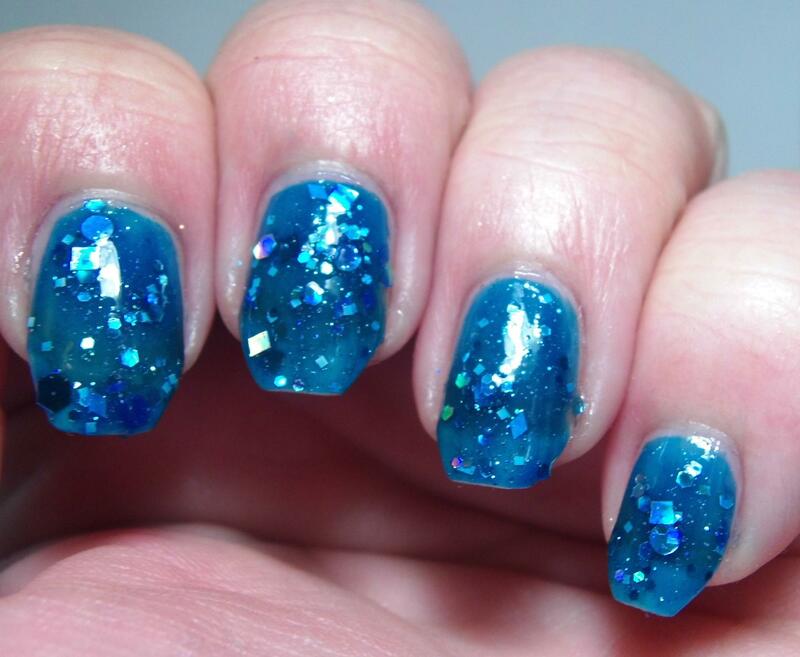 Ok, I do realize that folks who are not familiar with applying chunky glitter polishes may have a bit of a learning curve but this would be a great polish to start with because I had no need to fish for glitter and I did get good coverage. The picture shows three coats plus topcoat and while there is a very slight VNL it didn’t show up outside of the pictures. I’m guessing with the lights and my crazy prominant nail line it picked up for these pictures. Look at all that gorgeous glitter! LOVE! Squee! 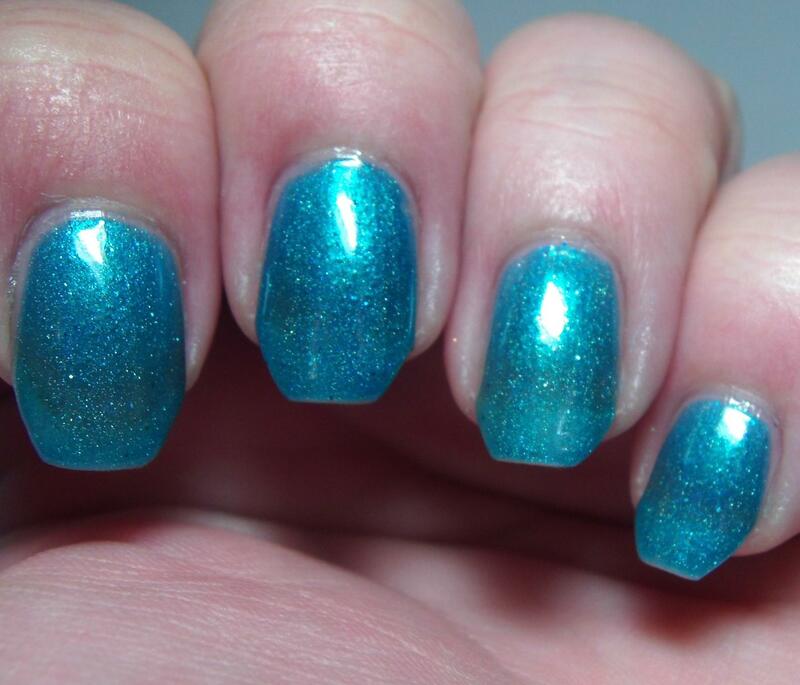 Perfect ocean teal shimmer jelly holo polish! This makes me think of the ocean and summer and the beach! 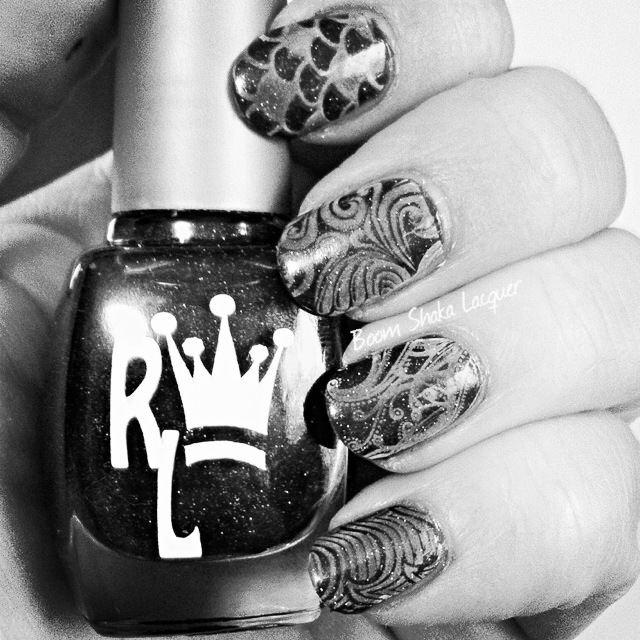 Also because it is a jelly it’s PERFECT for leadlighting and other stamping techniques and nail art. Again the VNL is showing but I could not see it before I photographed it. 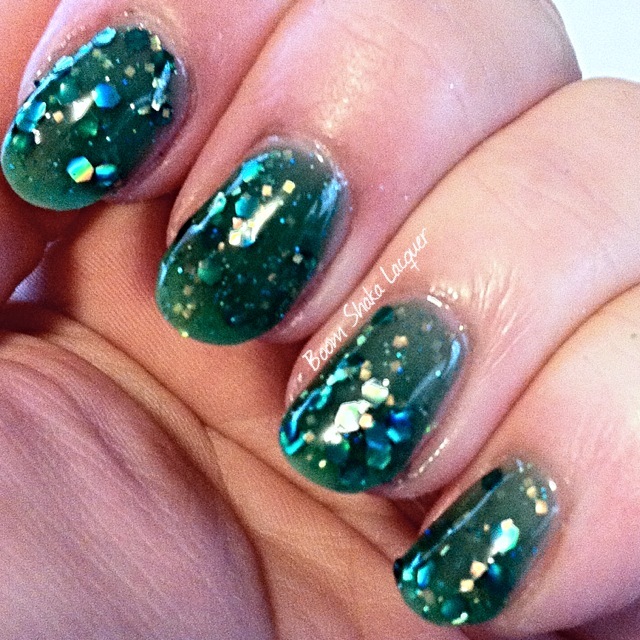 This is a jelly so it is sheer but it builds to opacity (unless you’re a camera under bright lights I guess!) in three coats. This would be a perfect polish to use for pond manicures or stampwiches, whatever term you like to use. 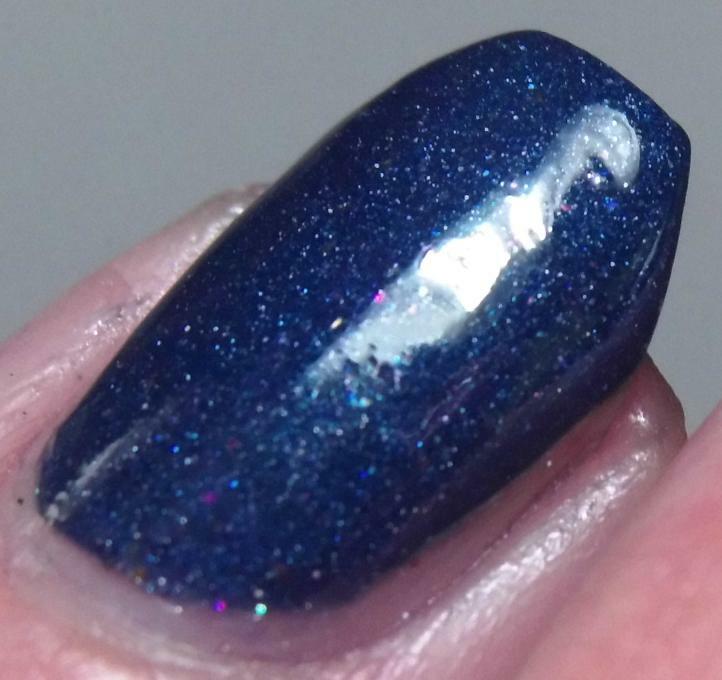 This is a gorgeous navy blue crelly based holo with ultrachrome flakies. Most boring description ever of such a pretty polish. I am ADDICTED to navy blue polish. I love navy blue nail polish so much and this one has so much going for it that I’m sure it’s going to become a staple in my collection. Application (and most importantly clean up!) was really nice with this. Darker polishes tend to be hard to clean up but this one really didn’t give me a lot of trouble. It’s beautifully self-leveling and I had no formula issues whatsoever. 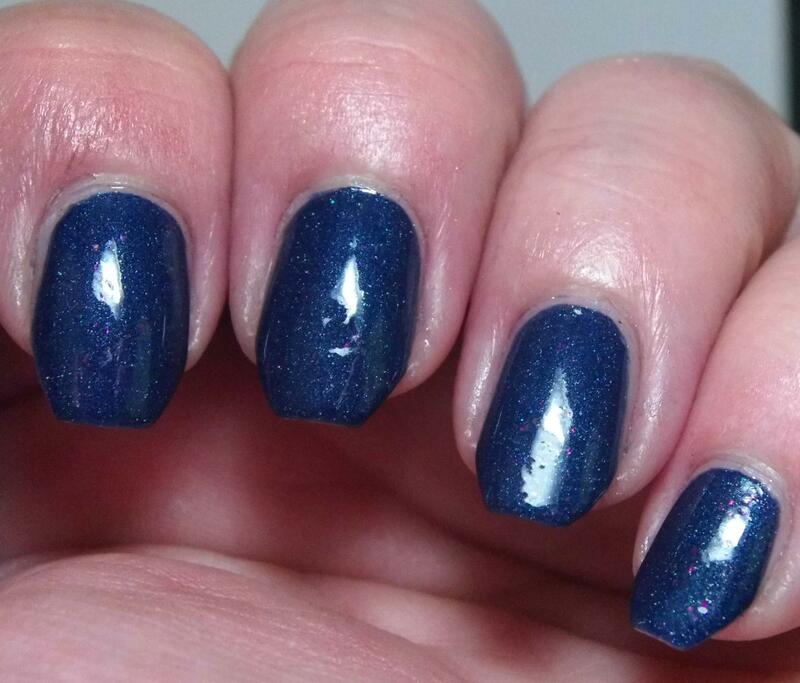 Can you see the pretty little flakies shimmering away in that gorgeous midnight navy blue polish. Gorgeous! 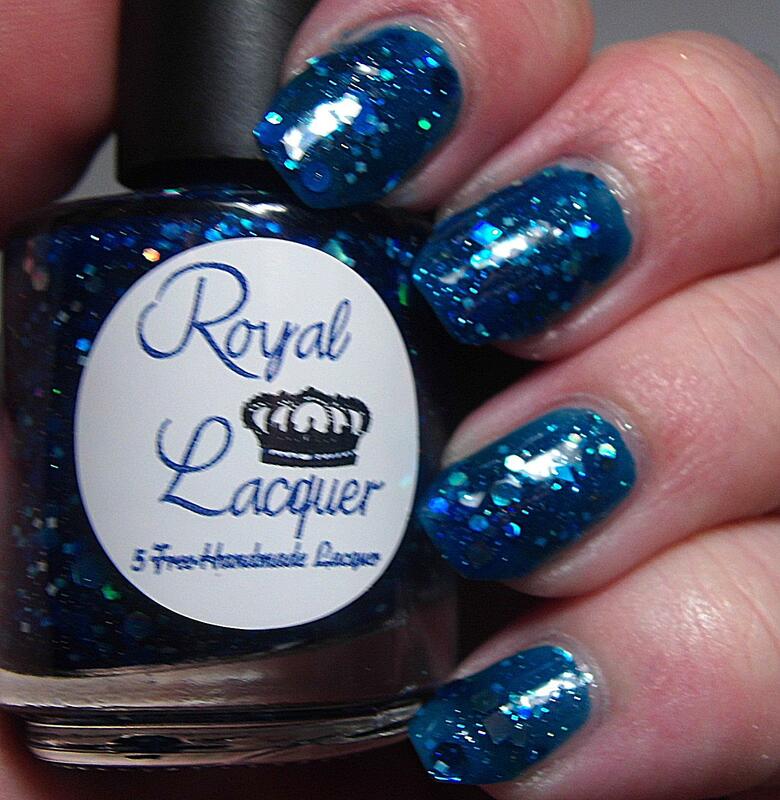 You can get Royal Lacquers nail polishes at her Etsy store (I HIGHLY recommend the Vynails as well!) 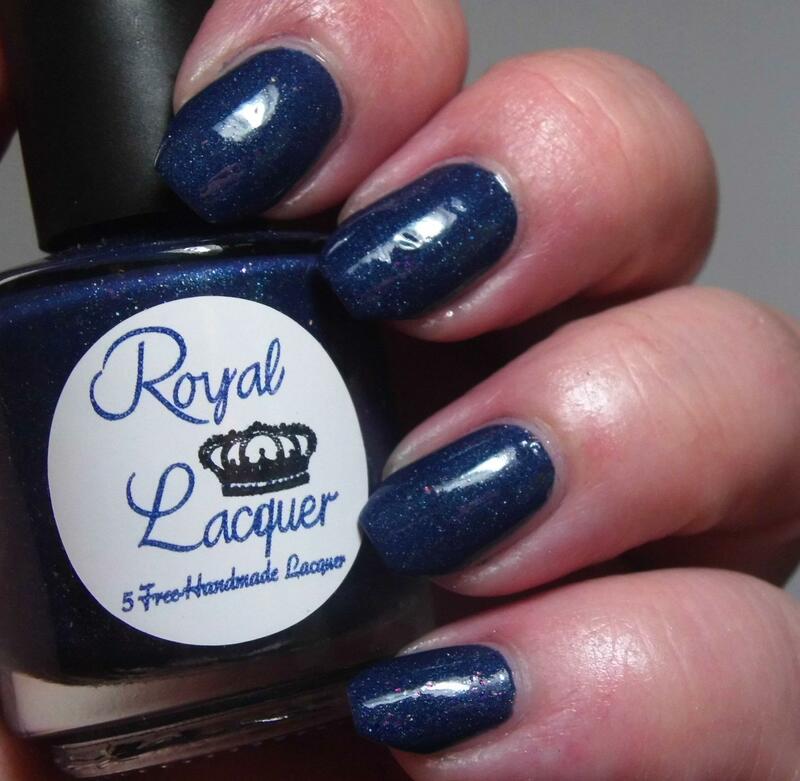 To keep up to date on all the latest offerings you should follow Royal Lacquer on Facebook and Instagram. So tell me will you be picking up some of these beauties? You definitely should! 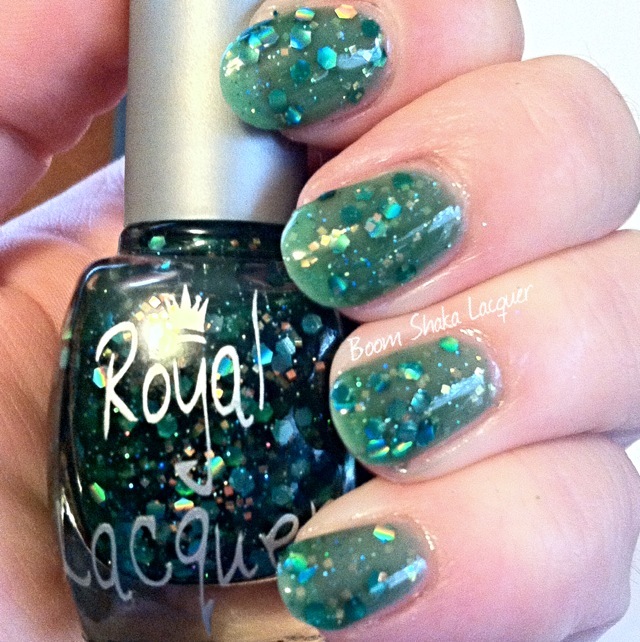 Royal Lacquer and Vynails Review! Hello my darlings! How are you on this rainy day? Oh is it not raining where you’re at? Well it’s certainly raining here. You know what that means! It’s time to paint my nails! Ok so that’s not much different than any other day but let’s roll with it! I have a fun review for ya’ll today! I was recently approached by a new indie brand who was wanting to get her name and product out there on the blogosphere and she sent me a lovely package to review! So we have new indies and her line of vinyl nail decals which come in a simply huge array of decorations for your digits! Digit Decorations! Quick someone make something and call it that because I’m on fire! Ok before I can digress any further let me get right down to business and around here that means pretty polish! First up we have Evergreen. Evergreen is a green jelly based polish filled with holographic micro-glitter, holographic green hex glitters, and metallic gold square glitters! I’m really loving the influx of true jelly polishes lately! Because this polish is a jelly you should expect that it is extremely sheer. These pictures show five thin coats and you can see there is still a very slight VNL in the pictures though in person the VNL was not noticeable at all. However the squish factor on this is through the roof!!! I’m totes digging on the squishiness of this one. While there is glitter in this polish it is not overwhelming or overpowering. This is good because I did use so many coats. There is the appearance that the glitters are curling, but I assure you those hexes are flat. I did not even need glitter food! 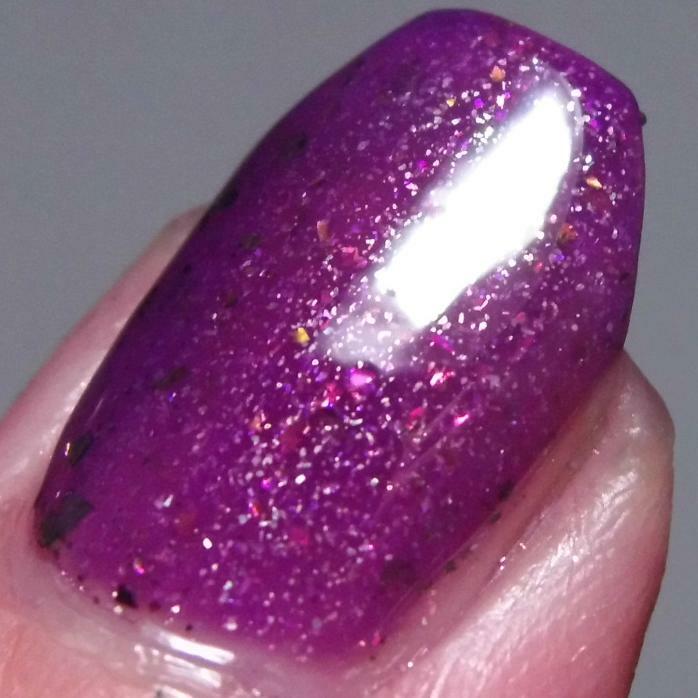 If you are deadset against VNL then you could layer this over another polish but if you do so I’d recommend the dabbing method of application so that you can get the amount of glitter that you like on the nail. Inner Rebel is a pristine white crelly based polish sprinkled with tiny hot pink, blue, and green glitters of varying shape as well as a gold holographic flecks throughout. This polish is so delicate and pretty! I think I’m starting to see a trend of dainty delicate crelly-based glitter polishes and I’m a fan! Application was easy breezy on this one – after the first coat I was definitely expecting to need to do three or four coats but this is actually two coats NO undies! This one did not need glitter food either and a nice shiny topcoat was all that was needed to smooth everything out! Last but definitely not least was my favorite polish of the three! Allow me to introduce Pearlie! *Swoon* Yes that is a stunning slightly blackened purple polish right there! What my camera could not capture is the AMAZING unique quality that it has. This purple crelly-based polish is PACKED with itty bitty tiny magenta micro-glitter and teensie tiny holographic aqua flecks. This makes it seem like the polish is glowing from the inside. It is so great! I’ll be honest – after the first coat I was slightly worried that it was going to take several coats to reach opacity. Readers, I was wrong!! The second coat brought the opacity and leveled out everything! This one does dry to a slightly matte finish and the teensie tiny glitters leave it with a somewhat gritty feel. Because of that and that cute little owl I did use glitter food to give it a glass smooth surface! Let’s talk about that owl! Isn’t it adorable? 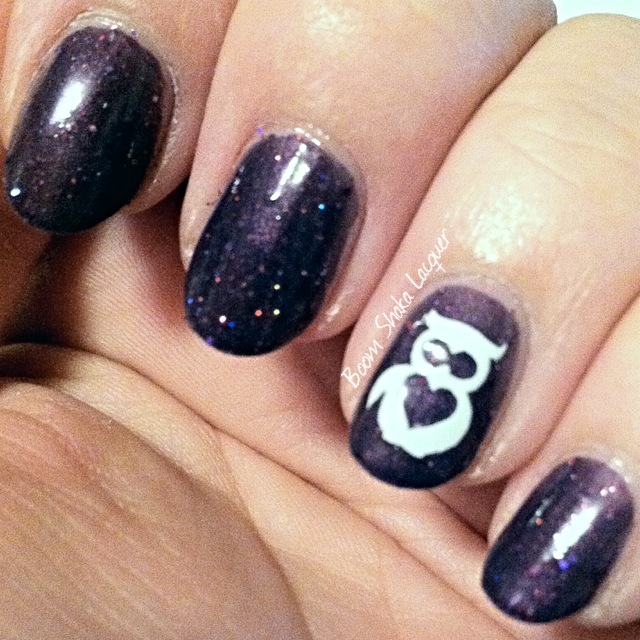 That my beloved readers is one of the Vynails decals! Super easy to apply – literally I grabbed a pair of tweezers, peeled it off the sheet, poked out the eyes and belly with a toothpick, and slapped it on the nail! Easy peasy! You can also use many of the designs that they have (there are scads of designs) as stencils by placing the negative space on the nail and painting over it then removing it before the polish dries to ensure a clean line. I foresee tons of manis in my future featuring cute little decals! Let me save you the trouble of hunting down these lacquers! You can find out all the happening news on their facebook page and you can purchase Royal Lacquer and Vynails in their Etsy Shop! Also since this has been posted Tiffany has kindly offered a 10% discount to my readers! Just enter BOOMSHAKAWESOME at checkout to receive the discount!